Jan Pleitner, Helios, Kerlin Gallery, 20 March – 28 April 2018 © Jan Pleitner & Kerlin Gallery. 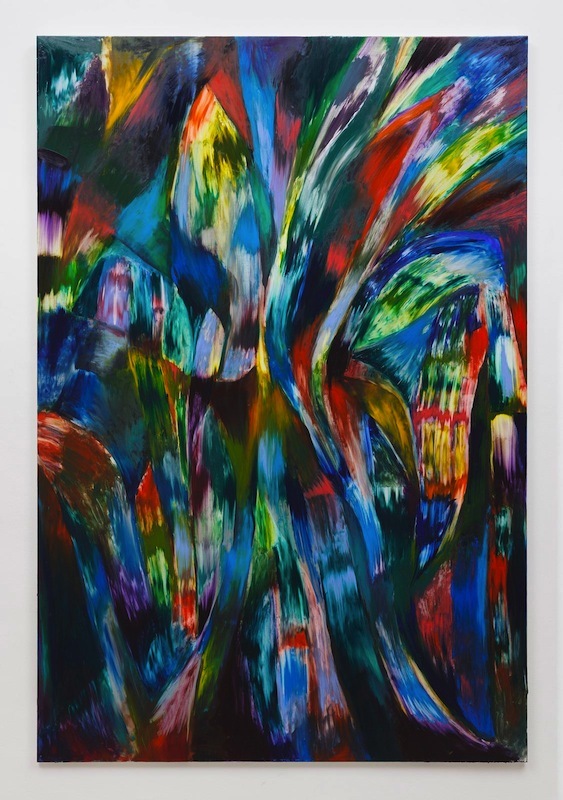 Jan Pleitner, Untitled, 2018, oil on canvas, 230 x 160 cm : 90.6 x 63 in. Kerlin Gallery Limited is a commercial outfit which provides representation to individual artists at art fairs in China, US & Europe. Unquestionably these operations inform its public base as a gallery of contemporary art. Doubling also as a point of sale, its Dublin 2 site houses temporary exhibitions of contemporary artworks, each open to the public without appointment. 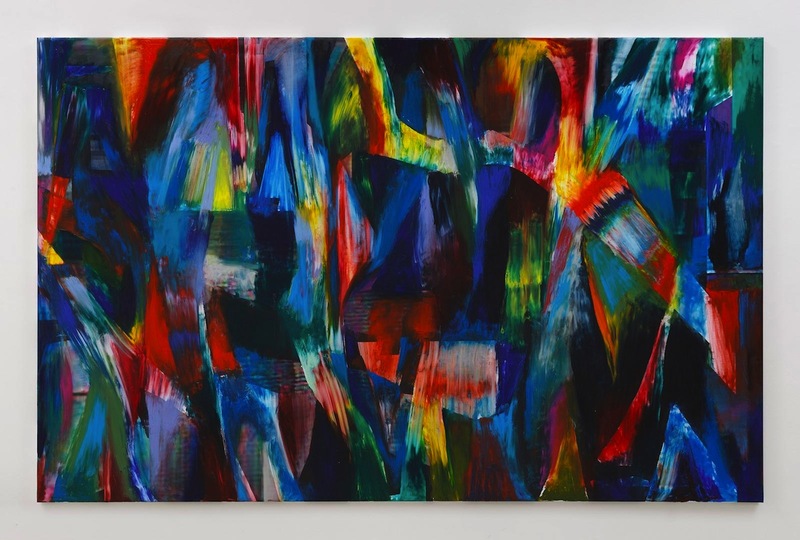 This latest exhibition offers works by German painter Jan Pleitner, nine of which are presented for sale, each one more or less similar in application and effect. A small poster for this show identifies what may be the artist, stood with one hand on the arcing frame of a modest hatchback car, layered up and with dashes on his trousers indicating simply another day in the painter’s studio. As each of these nine works is a variation of the same thing, in order to look at this series of paintings to see what sort of thing that might be, it is helpful to find the artist’s own thread, to see where his eye rests. 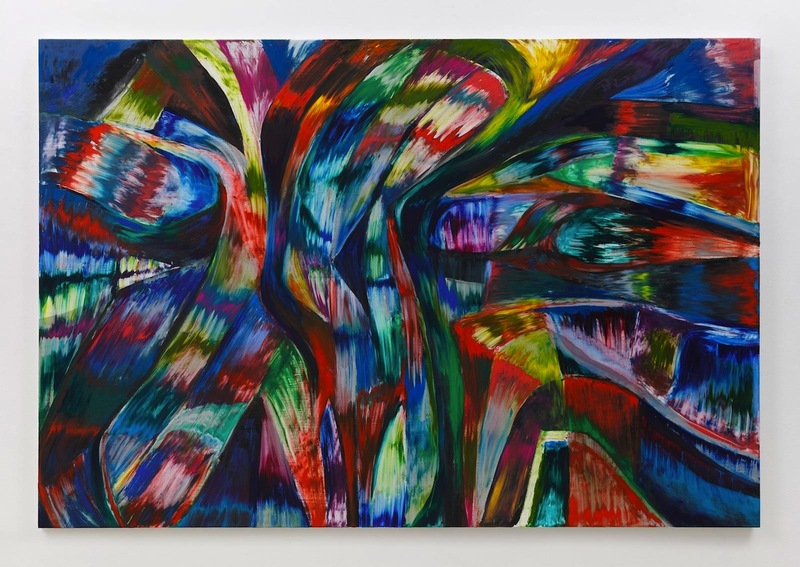 It is this critical reflex which has provided for the painter his stopping point, producing the works for this, his second solo show at the Dublin gallery. Colour theory is something that you might have heard of. It comes from Aristotle maybe, in around 300 BC, who proposed that colour came down from the gods in the form of celestial rays. Here and now, colour is probably more often expressed to us in its fabricated form, at least the sort of colour which doesn’t change through the seasons. You can say that the sky is blue but it can also be orange or purple. Life would not be life if the green of nature failed to turn with the phases of the moon. From antiquity, if not before, practices of paint-making were dangerous and essentially alchemical exercises which got at the heart of whatever connects the celestial with the material. Those familiar with colour theory might also recall Eugene Chevreul’s so-called treatise on colour, which directed mid 19th century French painters to look again at the colours they chose for their house-bound canvasses, in part by illustrating cultural epochs respective to their predominant colours. Underpinning this was a set of six harmonies such as hue, tone, scale, etc and the observation that colour behaved differently given certain variables. But before there was any such theory, colour was understood as precious, both hard to obtain as a usable substance and precious also because it occupies something of the human mind which is difficult to articulate without it being present. The tools we use to discuss paintings however are not colours but words. This is perhaps because painters must evoke the stability of colour in a way that illuminates light itself, whereas words, which have been invented from sounds, only stabilise at the arrival of meaning. 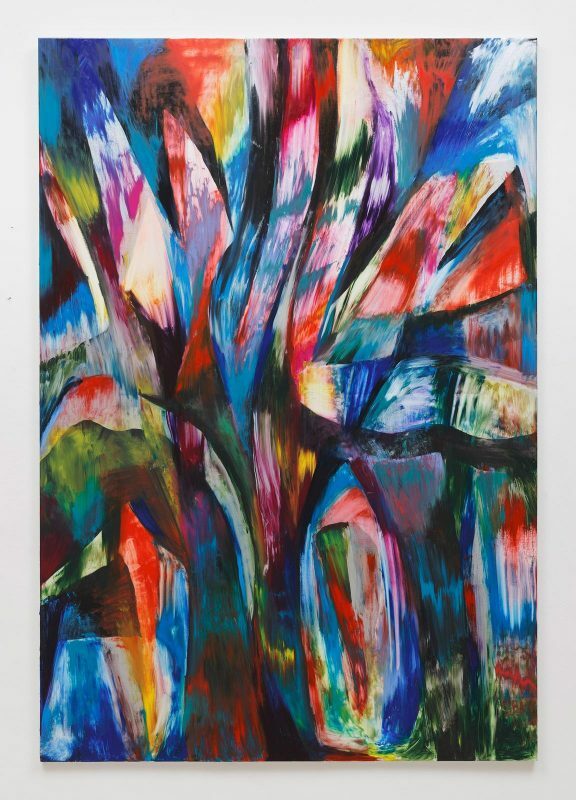 There are of course more trees in the world than there are words for tree, not to mention the imagined tree, of which you can see an example in Untitled, 2018. Yet, whether you can see it or not, the tree you are looking for is more or less similar to that which others claim to see. In terms of expressionist existentialism, or any other idea which necessarily divides the individual’s experience from that of their fellow man, really, that’s all that matters. As well as these nine paintings, the title Helios refers to an Ancient Greek god whose actions gave rise to the appearance of the sun, each day riding his chariot of horse-drawn fire across our skies. Exhibition notes refer to a commercially available shade of red which appears here in each painting, not unlike the colour of blood, and calls to mind the artist’s assumed sacrifice. But if Helios is the colour, Oedipus is the tone, with the myth of killing the father liberally explored here through paint. Whether it is the application, the linear focus, or even the brush used to make the painter’s broad sweeps, this is a visual language supported, in part, by Richter’s squeegee-wipe technique; the radial effect of Kirchner, where image content expands out of the canvas space; Franz Kline’s later monochrome works; and perhaps even the pastoral studies of Franz Marc, where signature inflections are taken from the natural world. Underlying all of this are the discoveries by Chevreul in the 1800s regarding the science behind how colour accents itself according to its surroundings. But if the colours make you look, it’s the curves which seek to draw you in, spreading tentacles reaching out, twisting back on themselves, existing somehow of another time, another plane. Hanging directly over one of Pleitner’s nine ‘Untitled’ works, there’s a spotlight which seems to shine unnecessarily in the well lit gallery space. Directed at a pair of eight feet tall fabricated forms, a subtle shimmer of gold is picked up by the additional light. Otherwise unmissable in the space, each structure serves to frame, divide and indeed act as a portal through which the paintings can be found. 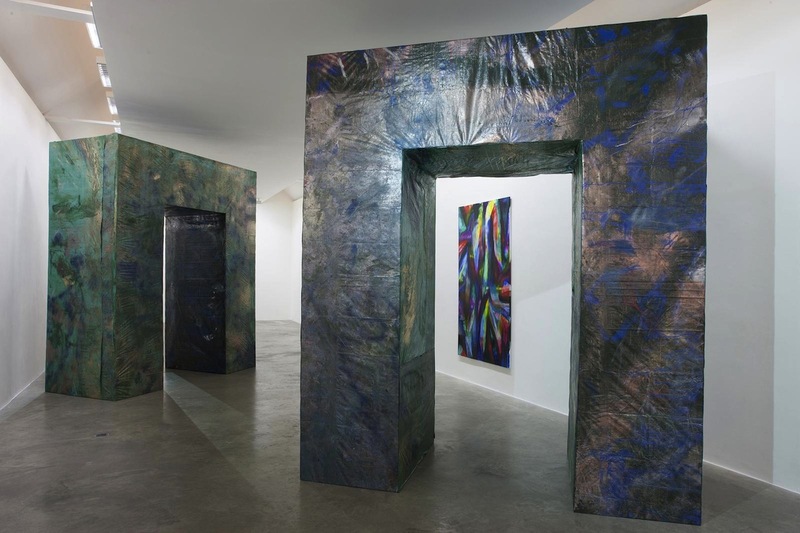 Covered in a cheap tarpaulin and painted roughly, it is worth saying again that these monolithic artifices merely underscore the commercial value of the nine gallery pieces. With every painting made in 2018 it is clear that Helios concerns things as they are right now. Just as often as the mythic component succumbs to the literal, so the dawning of a new day fails to translate into any comprehensible, political or societal rebirth, presenting instead more interpretations of the same removed experiences. If the theory can be believed, colour is our bridge to the heavens. In this series of nine works colour reverberates through the religious splendour of European Christianity and its many stained glass tributes. But here, symboIism is being dismantled in favour of a more secular sense of adventure. Not seemingly tied to either depiction or reflection, you imagine this is a popular combination for neo-liberal conservative tastes, but then who else is in a position to forecast and bolster the art market? With Jan Pleitner’s ‘Helios’ already proving a resounding commercial success, the question of who pays for art hangs heavy amongst the lightness and brevity of the artist’s paintings.